With winter around the bend, my classroom is becoming a winter wonderland! We will start out December with our study on Holiday Customs Around the World. I LOVE these fun activities! In addition to those activities, we ensure word work is engaging and meaningful with some fun games and practice opportunities from Working in a Winter Wonderland. Each year, my kiddos flock to play the sight word board games. They are such an easy and fun way to practice sight words. I just glue the game board to the inside of a file folder. Additionally, I glue the cover and directions to the outside before running the folder through the laminator. Many of my file folder games have 2 options. One with already inserted sight words and another blank version so each teacher can write in the words to be practiced. Use a sharpie to write in words after laminating so that the words will stay put. Removing that sharpie can be done easily with a product like goof off or even cheap hair spray! I’ve made these type of file folder games with simple die-cut shapes, too. Glue a path of the shapes to a file folder, laminate the folder for durability and then change the words to be studied as needed. All you need to add is a die and player markers. Old games pieces or mini-erasers work great! File folder games are easy to store and work for practicing all kinds of concepts. The big plus is KIDS LOVE THEM! I always have some sort of card game or two available in my word work center in my classroom. The kids become SO good at creating a variety of games to play with them. At the beginning of the year we go over how to play Go Fish, Old Maid, and Concentration (matching). We also talk a lot about using key words to create sentences and stories. The ones shown above are from the Working in a Winter Wonderland resource. You can find card games in nearly all of the ELA word work resources in my store. My students use our card games in all of those ways. They change things up as they please. Our card games work well for all of those activities. Letting them using the cards as writing “prompts” is great, too! The cards provide the subject matter and inspiration for a sentence or two. The adorable graphics inspire the to want to draw the visual to go with their writing. This type of word work is engaging and fun and allows a variety of learners and levels to work independently while I work with small reading groups or 1:1 with students. Let them get out of their seat. Allow them to stand, sit, lay down, and move. I love using pocket charts as a word work activity. Activities like the vivid verb one above are great for independent and pair or small group practice. In addition to including phonic pocket chart activities (like picture and word match), I provide the kiddos activities to practice things we are discussing during our grammar lessons. This one is particularly great for partner or small group work because while one student may provide an answer choice, the other children can practice reading the cards and/or suggesting alternative answers. I love using these sheets for independent work. They keep them engaged while I work other students with small guided reading groups. Sometimes we use the Compare with Details page during our Engaging Writing lesson time, too. I love using interactive readers SO much! This little cutie is so much fun. My kiddos are very accustomed to my interactive reader expectations so most of them can complete the tasks on their own or in partner groups. For this one, we use partners. This interactive reader is great for small and whole group work, too! This is the time of year that early writers truly begin to show development and a firmer grasp of writing concepts we’ve been working on all year. My “big” writing lessons usually cover the week. We begin with some concept ideas, read – alouds, lists and graphic organizers that outline topic details. We move on to a writing plan, where students organize their thoughts and structure. It all culminates with an adorable craft. That’s the reward. The carrot at the end of the “finish your writing” stick. This polar bear craft and writing lesson is SO ADORABLE on January bulletin boards. The writing lesson is a fantastic addition to our polar habitats study. We address all genres during our writing and do many lessons about writing with the very thorough and easy to implement Engaging Writing lessons. We utilize the same techniques with these theme centered writing activities are a fabulous way to incorporate our theme and social studies and science standards. It absolutely doesn’t hurt that they are cute and make fabulous bulletin board pieces, too! This narrative penguin story writing lesson is a definite fave! This writing plan strategy is so easy to implement. It definitely draws the kiddos attention and keeps them focused on the writing task. Their stories are beyond creative! And this penguin! They love putting together this bulletin board cutie! Each project comes with detailed writing lesson instructions and a variety of graphic organizer/writing plan templates. With all of the options, it is easy to meet the needs of a variety of learners. 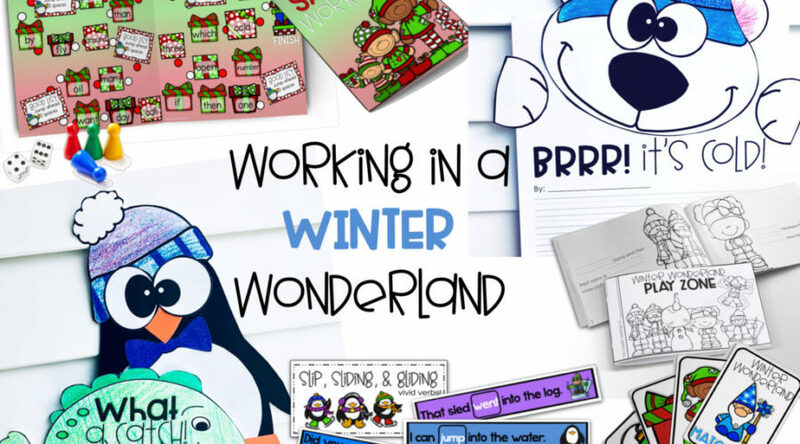 Check out Working in a Winter Wonderland for a HUGE assortment of winter-themed ELA activities.